Well now, if you are in the market for the new Nokia Lumia 900 Windows Phone, but haven’t quite got round to purchasing the handset yet, it might pay to hold off a little, as there could be a larger capacity Lumia 900 coming out to play. In fact there will be a larger capacity Lumia 900 coming out, as this has apparently been confirmed. According to the guys over at Ubergizmo by way of WPCentral, it appears that O2 Germany has given the stamp of confirmation that there is a 32GB Nokia Lumia 900 in white on offer by way of their Twitter account. 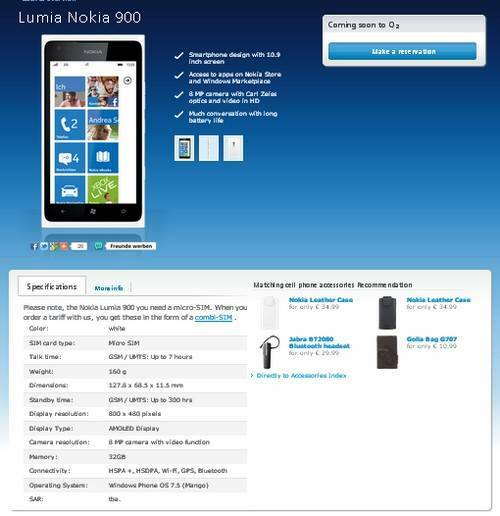 Apparently at first the mention of a 32GB Nokia Lumia 900 on the O2 Germany website was presumed to be a typo, but now O2 Germany have confirmed that it was no typo, and that the Nokia Lumia 900 32GB in white will be ‘coming soon,’ as evidence on their website. Of course although it appears that O2 Germany is indeed gearing up to offer a white 32GB Nokia Lumia 900 smartphone, it doesn’t mean that the 32GB version will become available elsewhere, having said that, I can’t see any reason why the 32GB version of the Windows Phone should be made available through other carriers in other countries. Naturally it is too early to slap a price tag on the 32GB Nokia Lumia 900 in white, as O2 Germany hasn’t yet got round to divulging that particular piece of information, but no doubt will do so before too long. So, does the arrival of a 32GB version of the Nokia Lumia 900 make anyone want to own the Windows Phone even more than before?